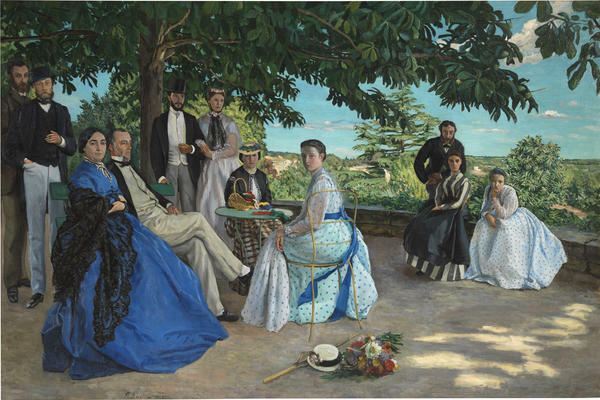 Frédéric Bazille's The Family Gathering has none of the quick, airy brushstrokes his future impressionist peers would discover; but the sunshine is there, as are the bright colors. 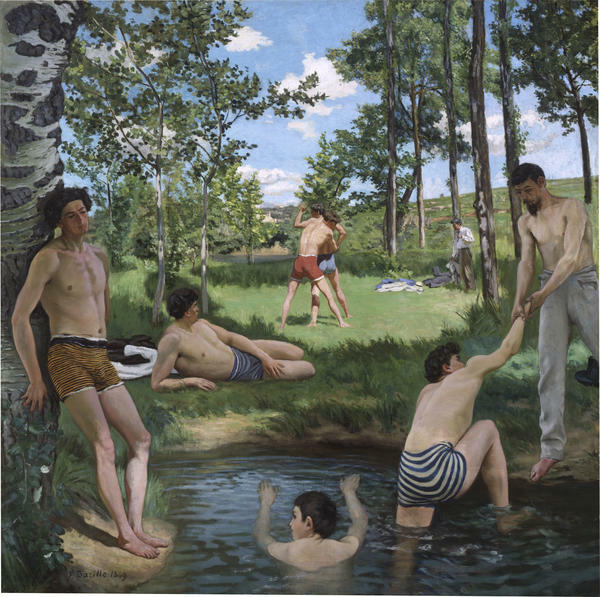 Bazille's Summer Scene (Bathers) earned him a spot in the Paris Salon. Araud understands, but says he likes Bazille for the opposite reason: The impressionists are so well-known, he says, "I've reached a point where I don't look at them anymore." Those impressionists were also Bazille's pals. National Gallery curator Kimberly A. Jones says Bazille "was very much part of that sort of charmed circle. Claude Monet, Auguste Renoir, Alfred Sisley — he was right at the heart of everything." Bazille and his friends were young 20-somethings eager to make new marks on the 1860s art scene. They shared studios, philosophy and gossip. "They were going to cafes, dancing, talking together," Jones says. Bazille and Monet were especially close, but Bazille was a very different artist. "Monet, I think, has such a natural facility for painting," Jones says. "He just sort of was born and could paint right away. Bazille had to work at it. I mean, he struggled with it." Struggling or not, all the artists in their circle were crafting what would ultimately become impressionism. Bazille's massive 1867 masterpiece The Family Gathering shows he's on his way, but not quite there yet. It has none of the quick, airy brush strokes Renoir and the others would discover, but the sunshine is there, as are the bright colors and the group on a terrace. The painting shows Bazille's family — his mother, father, aunts, cousins — on a hot summer afternoon. 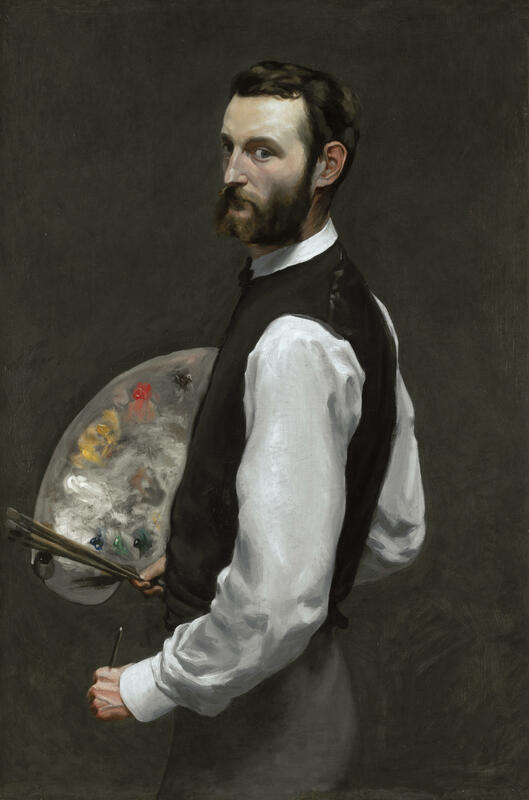 "They came together every year, actually, for Bazille's father's birthday," Jones says. Nobody looks very happy about it. Bazille's father leans back in his chair, with legs crossed and a grumpy mouth; Bazille's mother's hands are clutched over her cobalt blue dress. Most of the 11 people in painting stare at us in stiff poses, as if sitting for a photographer. Only Camille, the youngest cousin, is at ease, elbow on her knee, chin in hand. "Her mother's going to turn," Jones imagines, "and say, 'Camille!' And she'll sit up straight and put her hands in her lap and be very proper. But that moment has not yet arrived." Hunky (and happier) young men swim in another Bazille canvas called Summer Scene (Bathers). "He puts them in these fabulous bathing trunks," Jones says. "You can't pretend this is some classical subject; this is modern with a capital M."
On May 1, 1870, Summer Scene (Bathers) got into the Paris Salon — the place painters wanted to be. Two months later, France declared war on Prussia; a month after that, Bazille joined the army. "In November, he was killed in his first campaign," Jones says. "So less than a year after painting this, he's dead." Frédéric Bazille painted for only seven years. His friends went on to create some of the most beloved artworks in the world, but Bazille never got to impressionism. "Imagine if all of them died in 1870," Jones says. "How many of them would we remember today? Would we really remember Paul Cézanne when looking at these very rough, awkward uncomfortable paintings that he's doing? I mean, no one would look at those today, I think, and say, 'Here's a genius.' Would we really remember Sisley? Would we really remember Renoir? Maybe not." "Frédéric Bazille and the Birth of Impressionism" is a show about potential, what could have been. The exhibition's walls are filled with the ambition and ability of a young man, on his way to greatness. (SOUNDBITE OF MARC-ANDRE HAMELIN'S "NUAGES GRIS (TRUBE WOLKEN), FOR PIANO, S. 199 (LW A305)") Transcript provided by NPR, Copyright NPR.